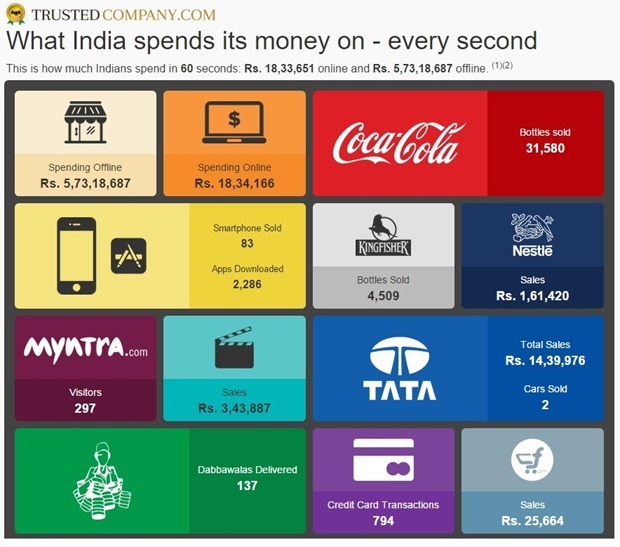 A recent Infographic published by TrustedCompany.com reveals what most of us Indians spend our money on. The Infographic discloses what the billion plus Indians are spending their disposable income on. Ours is a country where we have the largest democracy in Asia and what makes us more valuable is that the age group of 25-35 are higher than 0-10 and 60+ combined. That means that there’s little dependency rate but most of the population consists of youngsters who are eligible to earn. When the workforce is high, so is the income. According to Euromonitor.com, India’s GDP for 2014 is 5.4 and for 2013 is 5. The estimated GDP considering all the negative parameters, stands at 6.6. The annual disposable income for the country as a whole stands at $18,07,467 million. Trustedcompany.com came up with a real-time Infographic on how and where this disposable income is used. With the recent e-commerce boom in the Indian market and with Flipkart, Snapdeal and Amazon becoming household names, it is expected that it will overtake physical organized retail in next 5 years. However, as of today, according to the report, the average Indian seems to spend his money 35 times more in offline stores (which includes unorganized offline retail) than online. The next big spending destination is Wedding! The Big fat Indian weddings take the large piece of the cake with people highly uncritical of spending outrageous amount on weddings. Inspired by the same on the silver screen, Bollywood collections come in second with sales sky rocket every year. Looks like being a non-movie buff won’t serve you as an excuse if you didn’t visit your nearby cinemas. Coming to the automobiles, for example for every 30 mins, 1 Tata car is sold somewhere in India. The revenue is not disappointing at all. The Food sector is aced by Nestle and liquor sector sees Kingfisher seeing more than 4,500 bottles sold in 60 seconds. Though the Mallya fell from heights, his brand still seems to be doing good without him. In the softdrinks section, Coca-Cola has more than 31,000 bottles sold in 60 seconds. On the dark side, so has the consumption of cigarettes is quite high as well. Over 200,000 cigarettes are smoked by Indians in a minute! Many reports stating the rise in smartphone users are to be believed when close to 85 smartphones are sold in a minute which automatically gives rise to increase in internet usage. The credit card transactions do see an increasing trend, but not nearly close to other form of payments. In terms of habits, this study proves that India is a tea drinking and tea loving nation wherein the number of café coffee days can be found in almost every alley of any metropolitan cities but inspite of the cafes, Indians still remain tea friendly. On the whole, wedding still remains the blockbuster of every Indian household. That’s no hidden surprise for most of us. Check out this real-time-number Infographic that gives you an idea of how and where Indian spend their cash. Let the ticker run for a while and see how numbers grow!